Home»Plastic Cutlery»Clear Plastic Cutley 51ct. 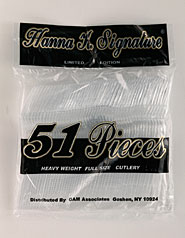 Clear Premium Plastic Forks 51ct. Clear Plastic Premium Soupspoons 51ct. Clear Plastic Premium Teaspoons 51ct. Clear Plastic Premium Knives 51ct.